Trainer Stephen DiMauro saddled the 1000th winner of his career Saturday at Gulfstream Park, sending out You Never Learn for a narrow victory in the first race. You Never Learn ($8.40) raced off the early pace before making a four-wide move around the turn into the homestretch and edging past pacesetter Belladini by three-quarters of a length at the finish of the six-furlong maiden special weight race. The Florida-bred 2-year-old filly was clocked in 1:12.28 under jockey Joe Bravo. DiMauro, who saddled his first winner in 1978, followed in the footsteps of his father, Stephen A. DiMauro, who retired from training in 2002 with 1,159 career victories. The elder DiMauro won the Eclipse Award in 1975, when he trained champions Wajima and Dearly Precious. “If I could be half as good as him, I'd be fine,” DiMauro said. Two Item Limit, a multiple-stakes winning mare who earned more than $1 million, was among the prominent horses trained by DiMauro. 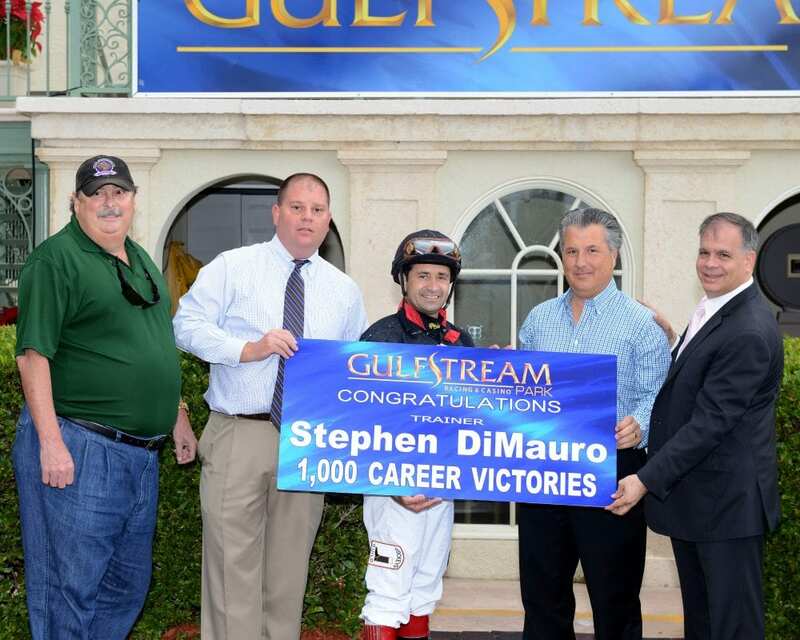 This entry was posted in People and tagged gulfstream park, Horse Racing, Stephen DiMauro, thoroughbred racing, trainer milestones by Press Release. Bookmark the permalink.